Hello, Brian here. More CTIA gems, back in the far left back corner of the show. Next to the hotdog stand. Yes. Here's 24/7, what Medis is claiming is the first disposable gadget fuel cell. 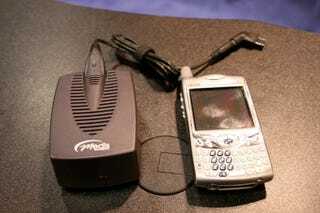 It'll recharge a phone like a Treo with up to 20 hours of talk time. And it comes with a handful of popular connectors. I'd call it portable, but in a fanny or backpack. It's basically not pocketable unless you dress like Vanilla Ice. But how else you gonna charge your cellphones and gadgets far from AC/DC? Well, other than these Backupower phones. Medis: How about a laptop setup? How about a version like this that is reusable? Make 'em, and you shall be adored by gadget geeks everywhere.